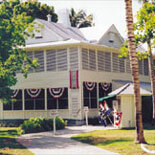 The Harry S Truman Little White House in Key West, Fl. was built in 1890 as the first officer's quarters on the naval station. The wooden duplex contained Quarters A for the base commandant and Quarters B for the paymaster. 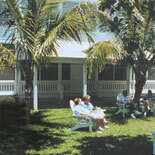 The house was built on the waterfront of the harbor of Key West. In the beginning of the 20th century, the home was converted into a single family dwelling to house the base commandant. The house has been host to many distinguished guests. Thomas Edison resided in the house during World War I, while working on depth charge research for the U.S. Navy. In 1946, Harry Truman began visiting Key West for rest and relaxation and returned for 175 days during his presidency. Quarters A was the Winter White House. President Dwight Eisenhower used the home while recuperating from a heart attack in 1956. In 1961, the Little White House played host to President John F. Kennedy and British Prime Minister Harold MacMillan during the Bay of Pigs incident. The house remained a living quarters for the commanding officers of the base until Truman Naval Station was closed in 1974. In 1996, President Jimmy Carter and his family, visited the home while on holiday and celebrated New Year's Eve here with family and friends. In April of 2000 the Joint Chiefs of Staff for the U.S., Great Britain, Germany, and France along with their wives had a private dinner at the Little White House. Our history tellers relate a fascinating & personal glimpse of the most important man of his time. Parking is available at Mallory Square or Margaritaville Resort Parking garage. Children prices are 5-12 yrs. of age. Children 4 yrs. of age and younger are free. Presentations start every 15-20 minutes. Parking is available at Mallory Square or The Westin Parking garage. For more information call: 305-294-9911.